Three fortified villages on hill-tops dotted over a level cultivated plain, probably in Jalaun District..
bl.uk > Online Gallery Home	> Online exhibitions	> Asia, Pacific and Africa Collections	> Three fortified villages on hill-tops dotted over a level cultivated plain, probably in Jalaun District.. This drawing forms part of the Marquess of Hastings collection. He was the Governor-General of Bengal and the Commander-in-Chief from 1813-23. 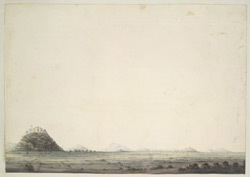 On his many expeditions throughout India he was often accompanied by an artist. The district of Jalaun has an area of 1477 square miles. It lies entirely within the level plain of Bundelkhand, north of the hill country, and is almost surrounded by the Jumna and its tributaries, the Betwa and Pahuj. The central region thus enclosed is a dead level of cultivated land, almost destitute of trees, and sparsely dotted with villages.